Open world games are awesome. Honestly, experiencing the sheer scope of Morrowind for the first time was just, well, mindblowing. Emerging from a dark, dank hold on a slowly shifting ship to see the undulating waters of the ocean and a small, coastal town nestled against green hills was an experience that made me smile and secretly cheer inside. Here was gaming at its best. No direction, a huge world in front of me full of possibilities, hidden secrets, dungeons filled with treasure and cities emerging over horizons. I want to express my adoration for open world games and I also want to encourage people to play any of the games on this list if they haven’t already. But how do I define open world? 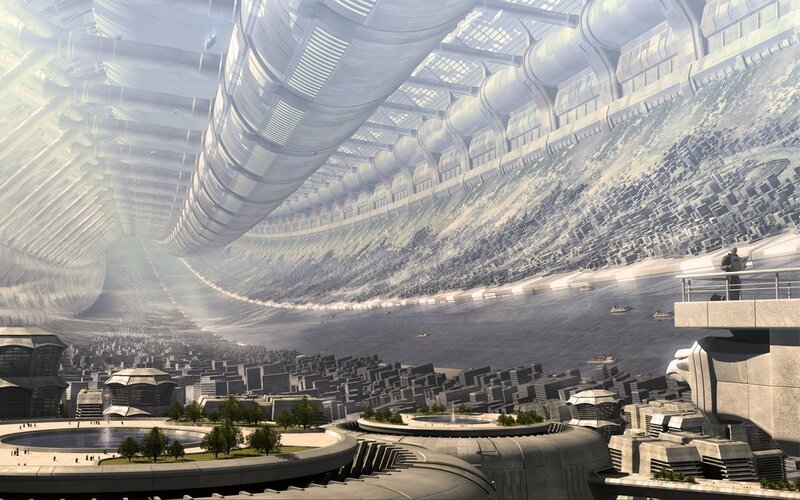 After all, if I leave out Mass Effect, fans of the game will point out exactly why it is open world. The same concept applies to a game such as Deus Ex. In Deus Ex I can approach situations a number of different ways. So how do I define open world in a manner that explains why some excellent titles aren’t on this list? Well, I suppose for the sake of this list, I don’t count Mass Effect because while there is a huge amount of exploration to be had in both the first and second games in the series (which is my favorite of all time, by the way) the different planets and places to explore don’t really ring “open world” to me. The planets are too barren and too devoid of places to explore to count as being a truly open world environment to me. Furthermore, even places like the Citadel are really just a large map rather than an open environment such as that in Fallout 3. That isn’t to say that Mass Effect isn’t an open world, it just isn’t open enough for me to include on this list. So without further clarification of what qualifies as open world, here are the five open world games that blew my mind and that I think everyone should experience. Okay, yes, Fallout 3 has its flaws. The dialogue is just plain awful. There’s no reason why computers should still be working several hundred years after an apocalypse and the main storyline isn’t fantastic. But despite all that, this game is deep and beautiful. You begin Fallout 3 in a vault, which is essentially a fallout shelter. You have been raised your entire life inside the vault and when your father one day escapes to the outside world you follow him to find out why he left and to save him from possible danger. As you step from the underground world you’ve lived in and into the sunlight, you can’t see a thing. And then, the world opens up beneath you. Raw, desert under a hot sun. In the distance, destroyed buildings slowly become one with the earth and you have no idea where to begin. There’s no guidance, no hints at where your father is. 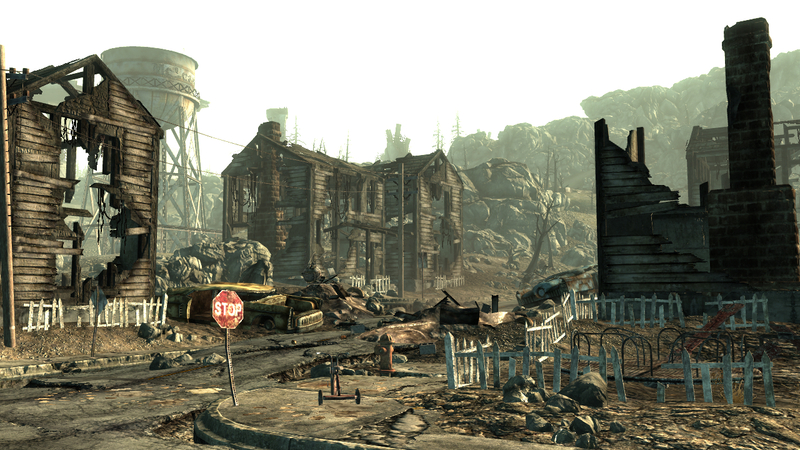 There’s just a huge, open world in what used to be Washington, DC and what is now an barely habitable desert. Fallout 3 uses the same graphics engine as Oblivion, and it does an amazing job of portraying a lonely, desperate world in which there is no law and killing is the fastest form of profit and the best way to ensure survival. It is a dog-eat-dog world and it’s downright depressing. In addition to raiders and others who want to kill you for what you carry on your person there are also mutant creatures galore. Despite all the desolation, this is a world that still feels very much so alive. Small communities of survivors bond together to thrive as best they can. Commerce lives in these communities and hints at a once glorious American past decorate rooms of destroyed homes and current shelters. Music by old bands like The Inkspots croon over the radio and a baritone-voiced DJ keeps survivors up-to-date on news in the region. Furthermore, the quests you come across in the game are genuinely fun and really can’t be ignored. When you first hear of a “vampire” family living underground through a sister desperate to recover her sick brother who has joined their ranks it’s impossible to not want to find out just how vampire-like the clan is and why her brother joined in the first place. Combine the quests and exploration with the rewarding addiction of leveling up and becoming a stronger, more capable wasteland hero and you have a first-rate, unstoppable game experience. Why is San Andreas on here instead of the groundbreaking GTA III or the stunning Vice City or, perhaps, the massive technological achievement that is GTA IV? San Andreas is the seminal GTA game on my list because it perfected the balance between an interesting, gang-based storyline and an all-out ridiculous sandbox experience replete with tanks, fighter jets and three cities to explore. Look, I won’t say that San Andreas has the best GTA storyline. That goes to GTA IV. And I won’t say San Andreas has the best graphics. That also goes to GTA IV, though, for its era, Vice City was the prettiest of the second generation GTA games. No, San Andreas is the GTA game everyone should play because of how fun it is. GTA: San Andreas expanded the game world from one city in GTA III and Vice City to three full-sized cities representing Los Angeles, San Francisco and Las Vegas. In between those cities was a vast area of countryside to explore and romp through. And the countryside features hidden surprises throughout. From a mysterious government facility in the desert to a graveyard for planes to a small town nestled at the base of a huge mountain, San Andreas’ countryside was arguably more fun to explore than its cities. 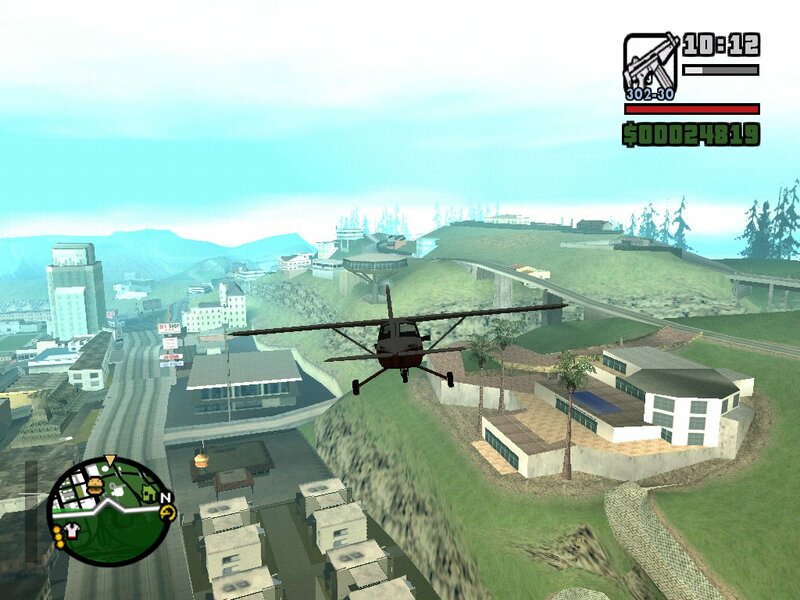 Beyond the world of San Andreas, the game featured such a plethora of fun activities to undertake that it couldn’t possibly qualify as just another GTA game. I spent hours simply commanding a jet fighter, bombing cars on the roads below me. I traversed the countryside in my numerous cars looking for hidden easter eggs and unique sights. I roared down the winding roads of San Fierro and flew along the highways of Los Santos only to block the road, take out a rocket launcher and create a massive pileup of burnt out cars while commencing to lead the cops on a long chase to the plane graveyard, where I would get into my jet and take them out from up high. Yes, GTA IV may have a more realistic-looking world, but it lacks the fun factor of San Andreas when the main storyline is finished. Vice City may be gorgeous and fun, but it’s not nearly as large nor as full of ridiculous things to do as in San Andreas. Is there a jetpack in Vice City? I didn’t think so. Mafia II will be coming out later this year, and I look forward to its release eagerly. Quite honesty, Mafia was one of the greatest open-world experiences I ever had. Why is Mafia a game everyone should play? Because it offers a unique twist on the sandbox game. Rather than being set in an RPG world or in the modern U.S. Mafia‘s setting is in the 1930s when the Mafia was king and men like Al Capone ran bootlegging operations and were afraid of no one. The game follows a young man, Tommy Angelo who, while driving a taxi, is hailed by a Mafia member and asked to get a wounded man to a private doctor. Evading pursuers, Tommy wins the admiration of the mobsters he helps and soon becomes a “made man”. Over the years he becomes disillusioned and works with a detective to help bring down the mob from the inside. The game features a stunningly depicted city based on New York and Chicago and features a beautifully rendered countryside replete with farms, tunnels, mountain, rivers and foliage. 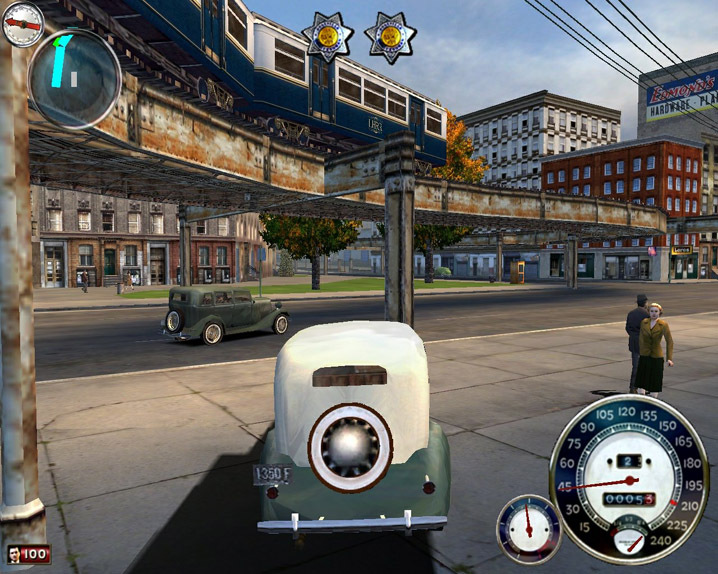 The game features highly realistic car physics, reflecting how real cars from the 1930s would have driven. Cops will pull you over for running red lights and issue a ticket, if you drive a car for long enough it will run out of gas and car accidents will actually harm Tommy. The story is absolutely compelling beyond words. It is highly detailed, full of emotionally-charged moments and tense firefights. Mafia is quite simply a game that must be experienced. But, I caution that it should be played on the PC. It’s not nearly the same experience on the PS2 or Xbox to which the game was ported a couple of years after its release on the PC. Yes, it’s another Bethesda game, but it’s hard not to be blown away by the beauty of the world Bethesda created. The swaying grass in the forest, the vast wilderness, the high mountains covered in snow. Unfortunately, Oblivion is plagued by many of the same issues that hurt Fallout 3 – the same voice actors for basically everyone in the game world and poor writing to go along with it. But, the world is just so beautiful and expansive that I can’t ignore this game or stress enough that everyone should play it. Half of the time I spent playing Oblivion was simply spent in awe of the surroundings. I strapped myself into the saddle on my horse and wandered through vast forests and would stumble upon amazing, hidden caves, small ponds, towering trees and vast hills. I made it a quest to reach the highest points in the game, climbing far up mountainsides in amazement at the detail put into the game. The green forests turned into aspen highlands that became snow-covered, rocky peaks. This is a vast world that is so stunningly alive that it just needs to be explored. By everyone. Assassin’s Creed was a flawed game experience. The story was weak and everything you did was repetitive. But, Assassin’s Creed II is simply a great, beautiful open-world game. 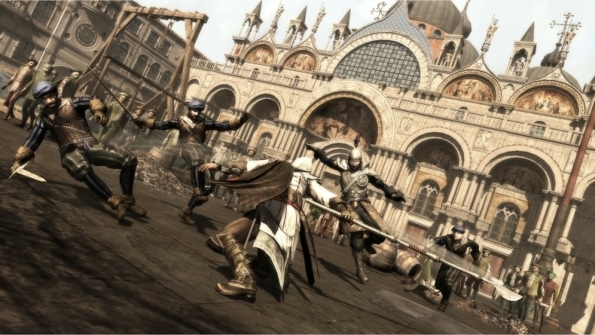 Set in renaissance Italy, Assassin’s Creed II takes place in painstakingly detailed recreations of Florence, Venice and Tuscany. The level of detail put into these surroundings is absolutely stunning and it’s worthwhile to play the game simply to travel around the cities, looking upon marvelous landmarks such as the Duomo in Florence and St. Mark’s Square in Venice. Furthermore, the Tuscan countryside recreated in the game is absolutely beautiful. Poppies grow in the fields and in the distance, churches watch over small Italian villages and villas. Beyond committing assassinations and attempting to discover why your father was killed, you now have incentive to climb to the tops of towers, collect feathers scattered throughout the world and purchase goods at stores – a villa. You essentially inherit your uncle’s villa, which is surrounded by a small, depressed village with shuttered shops and crumbling architecture. You can spend money on improvements to the town, and completing side quests, purchasing art and weapons and finding scattered treasures throughout the world will improve the villa to the point that it becomes a bustling, beautiful town reveling in sunshine and vibrant, green trees. Where Assassin’s Creed felt like a forced effort, Assassin’s Creed II is a near-perfect game. The story is far more excellent than in the first game and there is so much to do in this world that it is extremely addicting. Pick up Assassin’s Creed II if you haven’t already, and that includes all of you who hated Assassin’s Creed. Trust me. I hated the first game. I bought it and gave up early on because it just was repetitive and boring. Assassin’s Creed II is nothing of the sort. It is quite simply a game that everyone should try out.